Explore the beauty of Oregon's South Coast! best places on Oregon’s spectacular South Coast! Use our 184-page guidebook, “Out Our Back Door, Oregon South Coast Driving Tours and Day-Hikes” to discover the wonders that make this region so famous. From unspoiled beaches to the vast Oregon Dunes, to lush river valleys and soaring forest mountaintops, Coos Bay outdoor writer Tom Baake explores popular places and “back road” getaways. 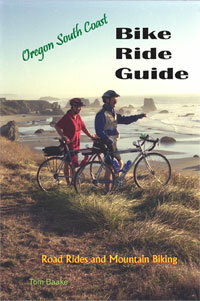 “Oregon South Coast Bicycle Ride Guide” is Tom’s latest book, and features more than 75 rides for road riders and mountain bikers from north of Florence to California’s far northwestern Del Norte County. The book features in-town rides in every South Coast community, as well as more ambitious treks into the surrounding countryside, as well as into and across the Coast Range. The South Coast is also a paddler’s paradise! In “Oregon South Coast Canoe and Kayak Guide,” longtime local paddler Ron Wardman explores recreational paddling opportunities from Florence to the California border, with outings for all skill levels. Ride the tides on excursions in coastal estuaries, check out freshwater lakes in the Oregon Dunes, and explore the South Coast’s famous Wild and Scenic Rivers. includes shipping Read excerpts from all three books by clicking on the links above, order directly from the publisher, get free shipping, and get ready to have some fun! Check out Tom Baake's Weekly Column in the South Coast Shopper HERE!